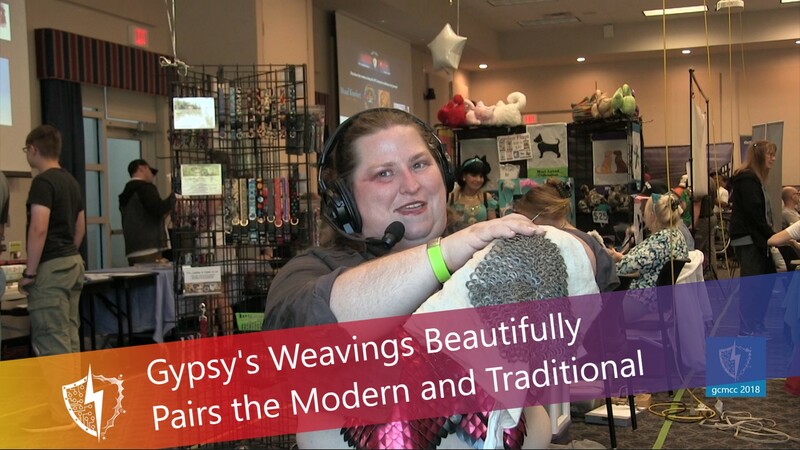 One of the first makers we ever interviewed was Ana Mailer from Gypsy's Weavings, and remains one of the most unique. Ana creates something that is fairly uncommon in modern life: chainmail. She got started in the Renaissance Festival scene making chainmail for costumes and competitions. Eventually she discovered that people were interested in her craft and began making items for others. One of the things that keeps her skills sharp is that every year, she takes on a challenge to learn a new aspect of the craft. While she initially learned the modern loop mail, over the years she has taken on the challenge to learn other styles and fastenings. The last time we spoke, she was learning scalemail, while is similar to standard chainmail, with the addition of dragon-like scales. Ana is wearing a scalemail top during her interview. This year, her personal challenge has been to learn the more traditional style of chainmail fastening. Unlike the modern, where the loop is opened and closed, the traditional method involves closing rivets with special tools, including an anvil. Obviously, this method is not as convenient as the modern method, which only really requires plyers to open and close loops. It requires the special tools, but is also far louder than the modern style, with hammers and anvils ringing with each loop being closed. Ana doesn't just take these challenges on for her personal experience. In the case of the traditional chainmail, she has done it to experience the history of the trade. She has even joined a competition that evaluates the accuracy of the process and the end product. She hopes that her annual challenge will pay off in this competition, whose prize is one of recognition among her peers.